Newer digital advertising formats -- including “in-feed,” native and paid content and video -- are driving the expansion of the so-called “display” advertising marketplace, according to an update of Zenith’s quarterly advertising forecast. The new findings, released this morning, show that these newer units will account for 14% of the annual growth in total display advertising, a category which itself will account for 64% of the growth in global ad spending through 2019. 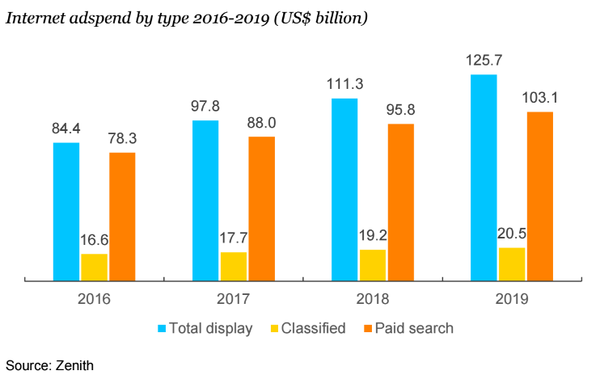 Not surprisingly, Zenith also forecasts that the total display ad marketplace will also emerge as digital’s biggest advertising segment, accounting for 50.4% of all Internet ad spending in 2019, displacing paid search and classified advertising for the first time.